Melania Trump has been confirmed to have returned to Florida to be with her son Barron Trump in Mar-a-Lago. The FLOTUS flew back to the luxurious resort on Thursday night, Dec. 27, and she traveled without Donald Trump. 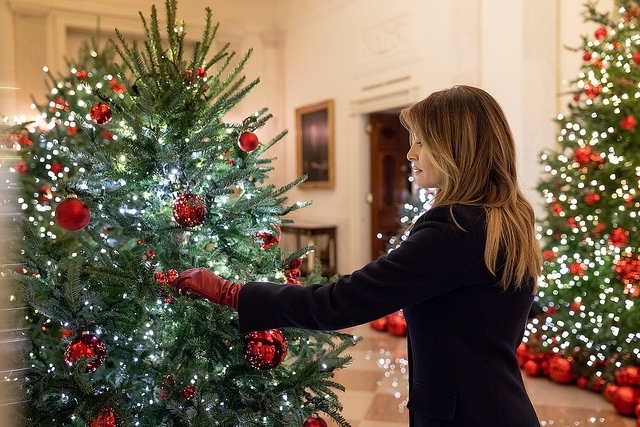 Melania Trump recently visited Iraq with Donald Trump and as soon as they arrived home in Washington, she boarded a private plane and headed to Mar-a-Lago where she intends to spend the New Year. So, why did the First Lady chose to celebrate the New Year away from her husband? It was revealed that Melania Trump will host the annual Mar-a-Lago’s New Year’s Ball which cannot be canceled anymore. She will attend the event where the attendees spent thousands of dollars to get in. Yes, there is a ticket to join the big gala night and prices start from $1,000. “It’s far from an ideal scenario but Melania intends to try and make the most of a bad situation and enjoy the New Years Eve ball without Donald,” a source told Hollywood Life. Melania Trump feels obligated to be there especially because the ticket prices this year had increased by $250. Donald Trump cannot attend the event due to the government shutdown so the FLOTUS wants to make it up by at least gracing the party. For Mar-a-Lago club members who would like to party with the First Lady and the President on New Year’s Eve, they are expected to pay just $650 while it is a thousand for non-members. The celebration is held at the Trump family’s private Palm Beach club. Melania Trump is hosting this year’s New Year’s Ball in Mar-a-Lago alone since Donald Trump needs to sort out the issues at the White House following last week’s government shutdown. The POTUS has been confirmed to skip the New Year celebration with his family but he will call his wife to wish her a happy new year. "He's canceled his plans for Christmas. Now he's canceled his plans for New Year's," Mick Mulvaney, Office of Management and Budget Director, told CNN. "He's staying in Washington, D.C. over New Year's."